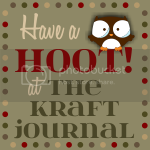 Merry Christmas from all of us at Kraft Outlet and The Kraft Journal! We hope you have the happiest of holidays! Christmas - December 21st through January 2nd. You will still be able to place orders online but NO orders will be filled or shipped on those dates.